Love these mocktails! So pretty! I am so all over this. Not only because of the watermelon, but also because of the ginger. And the fact that there’s no booze (it’s been a looooong summer). Love that you’re trying to hold onto summer…me too! This is so dang pretty! And yeah, I am a little jealous of your crushed ice. The only way I can make crushed ice is by taking a massive king ice cube and smashing it on my countertop (ice goes EVERYWHERE!). In my last pregnancy, I had kind of the same issue. I couldn’t stomach plain, flat water. And I still can’t unless it’s REALLY, REALLY cold. I love this mocktail! I kind of want one right now. I want to drink it as is… but I also want to pour gin in it. Happy weekend! YAY, hold the pumpkin, gimme all the watermelons. Plus ginger. omg! Ginger and watermelon…sounds great together! LOVE LOVE watermelon especially at this time of year! I’m semi-seriously contemplating a deep freeze so I can hoard summer fruit. Love love the ginger too! When I was pregnant all I did was eat watermelon! When I went to my favorite roadside stand to get my last melon of the summer, the man took one look at me and said, “Look’s to me like you done already swallowered a watermelon seed,” It was amazing. One of my all time favorite memories ever. Gorgeous! And I love that they’re mocktails! What nail polish did you buy? Your description of the color sounds like the stuff dreams are made of and I must have it! This drink looks and sounds amazing! I’m with you on fizzy, flavored water – and just this summer totally got into it. I don’t know why but for the first time ever just needed more than plain ole water. And proceeded to buy and try every flavored water under the sun! This looks like it would trump them all! pinned! This looks delicious Jessica! And I’m with you – still holding on strong to summer. I’m eating ALL THE ICE CREAM! You didn’t address the hardest part of the cocktail… the crushed ice!!! Do you buy it somewhere because I have yet to find it. And I’ve been known to use some weird time consuming tactics, and was wondering how you got the perfect crushed ice? Oh my goodness, I’m the SAME exact way!!! I’m 26 weeks pregnant, and water is so boring to me right now. I want flavored beverages!! I’m a little relieved to find out that I’m not the only preggo lady out there like that. Ha, ha! Oh, and for the record, this looks AMAZING! I wish I could reach into the picture, pull out a glass, and take a sip! These would be AHMAYZING with vodka. bahahaha I have a huge birthday coming up (threeOH NO YOU DI’INT!) and so I want to drink all of the things that blurr those lines. mhmm! Gimme all the drinks indeed! I love that ginger syrup in this.. I bet that taste amazing with watermelon. …. “All the fruit, all the time.” – 110% agreement. I LOVE the watermelon/ginger combo!!! Everyone stares at me freakishly when I take ground ginger and sprinkle it on my watermelon before I eat it. I’ve been doing it for YEARS!!! Glad I’m not the only one who has discovered that flavor combo. I too am very jealous of your crushed ice… This looks delicious and so refreshing! These sound delish! I’m with you about wanting all the fruit, all the time. I’ve been obsessed with strawberry watermelon smoothies all summer, and actually just had one earlier today. Yum! I’m still in watermelon mode too! I have one on my countertop that is waiting to be cut open. 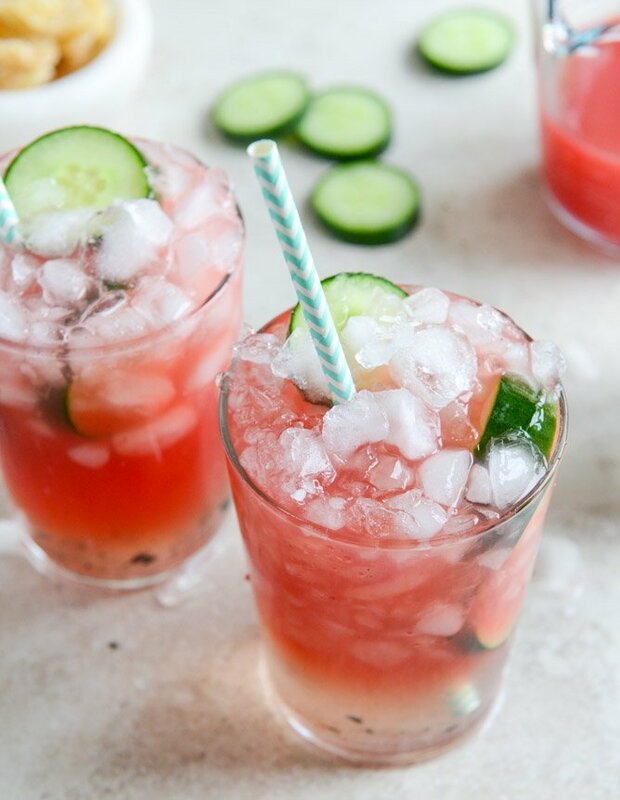 These sound so darn refreshing! I still haven’t had any watermelon this summer. Ahh! Pingback: I’ve been drinking… | MUST WE? From one pregnant lady to another, thank you. This does look really fun! I love watermelon and it is without a doubt my favorite summer fruit! So simple and refreshing and perfect timing for the two little babies I have on my counter; thanks!